DeMar DeRozan was the face of the Toronto Raptors for nearly a decade before being traded to the San Antonio Spurs this offseason. Though he lived in Toronto during the year, his main offseason residence was in his hometown of Compton, CA. He recently purchased a $15 million mansion in the Hidden Hills neighborhood. But if DeRozan were to take up residence in the state of his new team, he could potentially save a ton of money. DeRozan still has three years and $83 million left on his contract. In California, someone in his tax bracket would owe 13.30 percent of his income to state taxes. That's a little more than $11 million for just his individual income, or about $3.7 million per year. California also has one of the highest sales tax rates in the country. DeRozan is saving money by not buying things in-state. Meanwhile, there's no state income tax in Texas, so DeRozan could save millions simply by changing his address. But wait, there's more: professional athletes pay a "jock tax" for wherever they play games. Before being traded, half of DeRozan's NBA paychecks were affected by Canadian tax. That's 13.16 percent from Ontario taxes, the province in which Toronto is located. In fact, for Canadian earners in the highest tax bracket, they pay 53 percent in taxes. That's more than half their earnings! 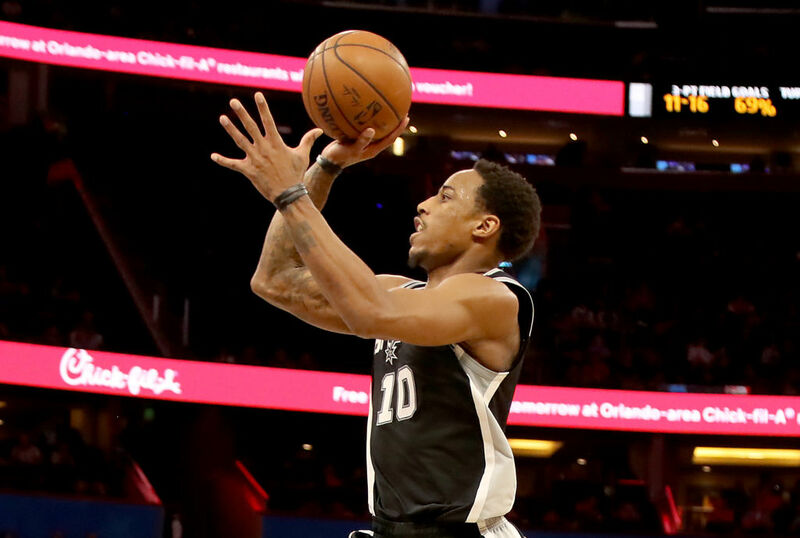 DeRozan now avoids those Ontario taxes by being in a Spurs uniform. All told, between Federal, Canadian, and state taxes, DeRozan stands to save about $20 million in taxes over the next three years if he lives in Texas instead of California. While it's unclear if he'll actually make the move, it's gotta be tempting. After all, it's not every day you can save $20 million, right? If there's a story anywhere in the world of music, sports, or entertainment, Joey wants to tell it. He's been freelancing since 2010, and prior to that, he attended the University of Miami, where he double majored in broadcast journalism and sport administration. A Chicago native, Joey currently resides in Austin, TX. Follow him on Twitter and always feel free to suggest a song for his next karaoke performance. Joey's favorite billionaire is Mark Cuban. DeMar DeRozan has the most expensive mid-range jump shot in NBA history. Here are the reasons why the Raptors should be very, very happy with their investment. Thanks to their gamble on Paul George, the Oklahoma City Thunder may have just re-imagined a strategy for the entire NBA. Drake and his hometown Toronto Raptors are giving back in a big way.